A few weeks ago I received a message with an invitation that I almost turned down due to prior family commitments. It would have been with a heavy heart, though, as this was truly a once-in-a-lifetime opportunity. Luckily, both my husband and Ilana persuaded me to change my mind, so I embarked on a trip to learn about the food and people of one of the world’s most iconic countries: Israel. A 13-hour trip landed me in a very unfamiliar territory. Accustomed as I am to traveling to places where I can’t speak the language, here I couldn’t even recognize the alphabet. Fortunately, nearly all the Israelis I met spoke English (and a few also spoke Spanish). After being welcomed by a sweet older lady from the VIP service hired by the organization that brought me to Israel, I breezed through the dreaded Israeli airport security process. My friendly and talkative taxi driver was waiting outside to give me a first impression of the Israeli people in their natural habitat. This quickly put one of a few misconceptions I held about Israel to rest. Unlike most Dominicans, I was not unfamiliar with Israel, its people, and history. I had met a few Israelis, some were my coworkers and clients a long time ago. Aunt Ilana herself grew up in Israel and had given me as broad a view of Israel’s people and culture as one could possibly get from over 6,000 miles (10,000 km) away. One thing they all mentioned was the Israelis’ famous — or perhaps infamous — straightforwardness. I prepared myself for the shock, after all, this would contrast with my own culture, in which we bend over backward not to tell people uncomfortable truths. I should have known better, do not judge a people until you meet them in their home ground. While there is truth to the Israeli reputation for directness, I am guessing they know how to tone it down for us clueless foreigners. Though I flew to Tel Aviv — the unofficial capital of Israel — we drove to Jerusalem for a meeting with my hosts and the four other Hispanic bloggers who would be accompanying me on this tour: Heidi Leon, Txaber Allue, Bren Herrera and Layla Pujol. Vibe Israel, an unaffiliated non-profit, has been inviting some of the most influential bloggers from around the world to Israel (all my expenses were covered) to experience first-hand what this young country has to offer. I came to learn about the local cuisine and vibrant culinary scene. After the introductions were over, we went for a stroll, and for my first taste of Israel at Chef Avi Levy’s Beit Hakavan and its Algerian-influenced cuisine. It did not disappoint. Contentious history aside, Jerusalem offers food from the diverse cultures present in the city, many familiar tastes, and some very new to me. The (predominantly vegetable-based) food was flavorful, seasonal, unpretentious and very well presented. Jet-lagged and exhausted as we were, we devoured that first dinner like food was running out. But there was more to come, oh boy, would there be! After a restful night’s sleep and breakfast at the Mishkenot Sha’ananim Guest House — a historical site with a magnificent view of the Old City walls and impressive list of distinguished former guests — we went for a walk of the Old City of Jerusalem, which was as moving as you can imagine. We then headed to the Mahane Yehuda Market, a tour which put us in contact with Halva (a sweet sesame paste) and Bourekas (local turnovers), foods that we would encounter many times throughout Israel. The Market is a food lover’s paradise, both clean and chaotic, mesmerizing to all the senses. I could have easily spent a whole day there. As luck would have it, there was much more to come: A fun cooking demo at Chef Tali Friedman’s Atelier, and later the punchy duo of amazing dinner and loud music at the very trendy and very popular Machneyuda Restaurant with the very dynamic Chef Uri Navon. You can see more of our Israeli Adventure seen through the lens of the talented food photographer (and my new BFF) Haim Yosef. If I called Mejadra a “Middle Eastern” and not a “traditional Israeli” dish, it was for a good reason: there is no such thing as “traditional Israeli cuisine”. If you are sufficiently shocked — I know I was! — let me now clarify that statement. Israel is very young; many Israelis alive today were there for the foundation of their own country, and they came from all over the world: Eastern Europe to Latin America, Ethiopia to India — and everywhere in between. Some Israelis are ethnically Jewish (though not necessarily religious), some are Christians and some are Muslims (though, again, not necessarily religious). This is, to use my Huge Understatement of the Day, a complex nation. You can imagine now the gastronomical Tower of Babel that is Israeli cuisine. And that is its strength. Step from one market stall to another and it’s like going from one time zone to another, culinarily speaking. Mejadra is a humble dish, a comfort food. It’s simple in its preparation, inexpensive in its ingredients, but with very complex flavors, some familiar to Dominicans (rice and lentils), some unfamiliar (cumin and turmeric). The good thing is that all of its ingredients are available from any decent local supermarket. Clearly, there is no one recipe for this dish. I’ve come up with one I loved; I detail my sources at the end of the recipe. Rice with Lentils and Fried Onions (Mejadra) Recipe: a marvelous Middle Eastern dish that reminds me a bit of our own "Moro". I see myself making this many times to come. Boil the lentils, in enough water to cover it plus an inch [2.5 cm], over high heat for 15 minutes, counting from the time it starts to boil vigorously. Remove from the heat. Separate lentils from liquid. Set both aside. Heat the olive oil in a heavy skillet over high heat. 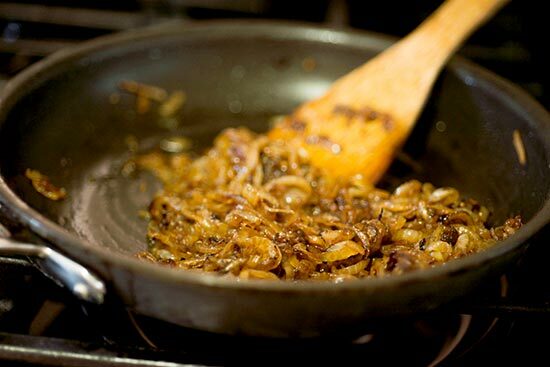 Stir in the chopped onion (set aside the onion rings for later use) and continue cooking and stirring until they are cooked-through and have a golden-brown color. Season with cumin, turmeric, coriander seeds, cinnamon, table salt and pepper and mix well. Pour in the rice and lentils, and stir, mixing until the grains are coated with oil. Add 3 cups of the liquid in which the lentils boiled (include water if you don't have enough of it). Lower heat to medium-high. Simmer until almost all the liquid has evaporated, stirring often to prevent the rice from sticking to the bottom. Mix in okra and chickpeas. Cover with a tight fitting lid and lower heat to a minimum. Simmer for 15 minutes. Uncover and stir, the rice should be cooked-through but firm. If needed cover and simmer for another 5 minutes. While the rice simmers, coat the onions you cut into rings with flour and coarse salt. Heat the vegetable oil over high heat. Fry the onions until they turn golden brown. Rest on a paper towel to absorb excess grease. Serve the rice warm, garnish with fried onions and cilantro. This recipe, as hinted in the intro, is a mixture of several recipes and ideas. The idea for the chickpea and okra addition came from Magdalena Restaurant, although, as you can see in the photo further above, theirs is quite different. It was also based on the recipes in the books Jerusalem: A Cookbook and Fresh Flavors from Israel. Claudia Roden, the Egyptian-Jewish author of The New Book of Middle Eastern Food writes: "[Mejadra] is such a favorite that, although it is said to be for misers, it is a compliment to serve it". 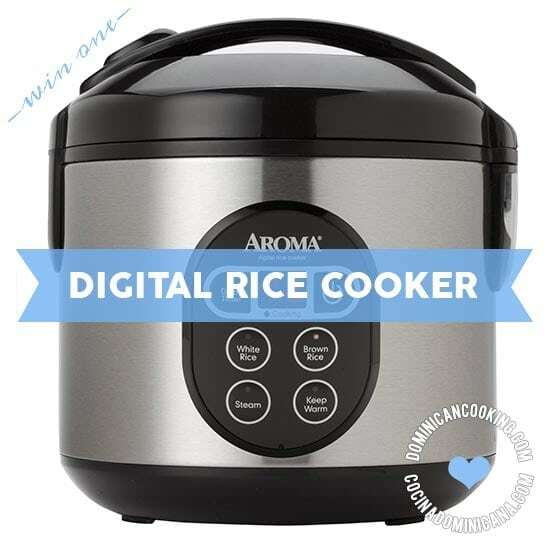 If you want to use brown rice, soak the rice for two hours prior to starting, and drain all water beforehand. You can use this water if you don't have enough from boiling the lentils. I love trying different foods, this Majadra looks really good. As both a Dominican and a Jew, I cannot get enough of majadra! I have a favorite Israeli restaurant in Los Angeles that knows me by name…especially when I’m pregnant. My mom used to make a morro with lentils that is so similar, it tastes like home. I hope you had some kibbeh/kubbeh in Israel. I couldn’t believe when I visited that they were basically quipe by another name! I did eat kibbeh, as well as tabouleh and something very much alike our niños envueltos (though the ones in Israel didn’t have meat). I am writing the third and last instalment now, I bet you won’t want to miss it. What an amazing trip. Traveling is such an eye-opening, exciting experience. I can’t wait to see more recipes from your journey.